Can you imagine having ‘oh my god, I live in Spain’ moments? Maybe you’re at the place where ‘oh my god, I’m thinking of living in Spain’ moments are giving your stomach butterflies. 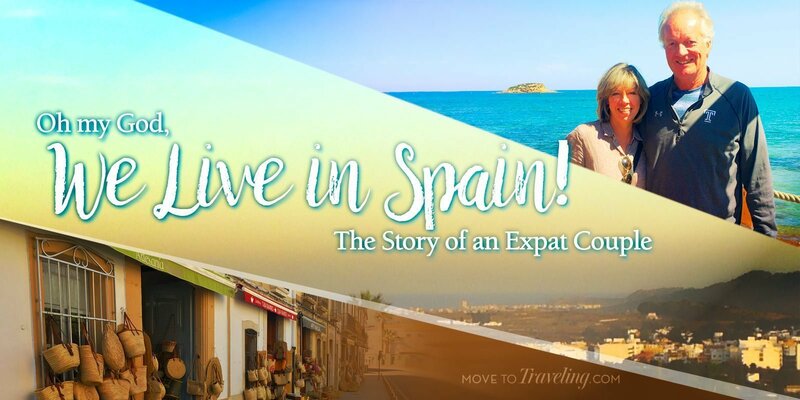 Whatever your story is, the day can come when you can say ‘I’m living in Spain’. For John and Allison Byford this was the case, and they purposefully spent a couple of years dreaming and planning. 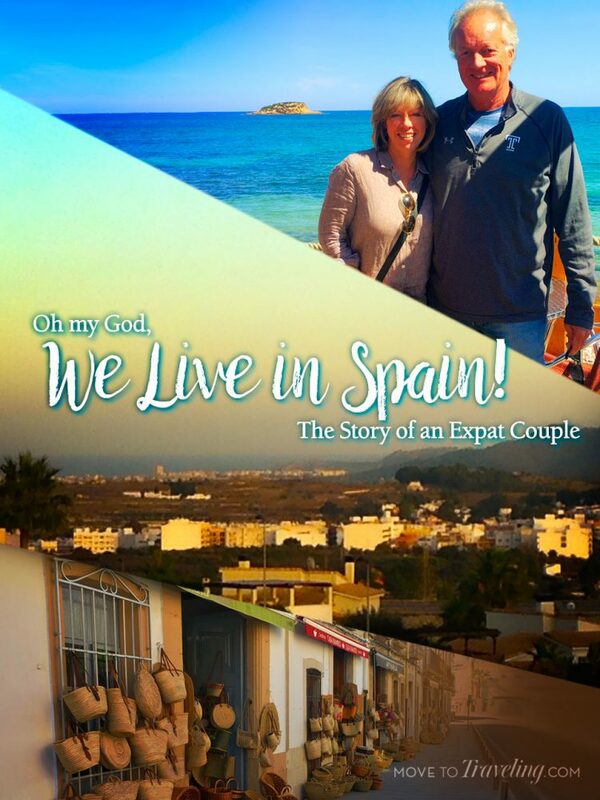 Having met them when they moved to our area of Spain last year, we knew that their story would be inspiring to all of you who want to live in Spain as well. My first experience of Spain was as a result of the package holiday boom in the mid to late sixties, when I was around 11 or so. I went on holiday, with my parents, to Calella on the Costa Brava and immediately loved the weather, specifically the sun, which didn’t love me back as I was a blonde, blue eyed, white skinned English kid who immediately was transformed into a blonde, blue eyed, red skinned English kid. Between age 11ish and age 35 I visited Ibiza, Majorca, the Costa del Sol, the Costa Blanca and Almeria and loved every place I visited. At age 22 I had the dream of working for a summer in Spain but couldn’t find anyone to go with me, so the dream died, but my need to travel didn’t. Fast forward to 1994 and, after working in the U.S. as a “soccer” coach in the summer of ’93 I decided, at age 40, to leave England and pursue my dream of coaching as a profession which took me to Philadelphia. In June of 1999 I met my wife, Allison. We got engaged in August and married in November and, even though she had visited California, Colorado, Bermuda, England and Ireland she had never lived outside of the Philadelphia area. Two years after we met I took Allison away from the job she had for fifteen years and the area she had lived in her whole life and we moved to the suburbs of New Orleans. Two years later, again because of my work, we moved to the suburbs of Baltimore where we stayed for five years. My career then took us back to the Philadelphia area, where we spent the next six years and from there we moved to the San Francisco Bay Area. Little did we know that this move would be instrumental in our move to Spain. As a footnote, we did most of these moves with at least one and sometimes as many as three cats. The climate and terrain of Northern California reminded me a lot of Spain, which I hadn’t visited in 15 years, and, having dragged Allison around the country to some places she liked and some she didn’t like so much, we had finally found a place that we both loved and blossomed in. We lived by rolling hills, vineyards and if we drove west there were mountains that went down to the sea. 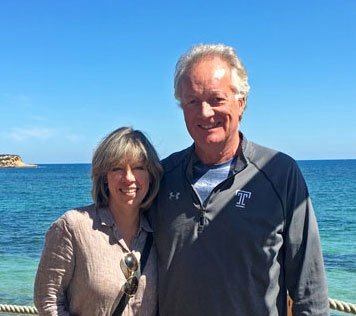 Unfortunately, two years later, our California dream came to an end when Allison’s mother was taken ill and we had to move back to the east coast and the Philadelphia area. Sadly my mother-in-law passed away four months later which was the beginning of a trying time, particularly for Allison, who had to settle her mother’s estate all the while being back in an area that neither of us wanted to be in. I suggested that a nice holiday might be a welcome escape and, given how much she enjoyed California and how similar I thought it was to Spain, that visiting Spain might be a good option. That was when my dream of living in Spain began to resurface and I started to do some research on the internet and bought Allison a book about living in Spain. (I’m nothing if not sneaky). 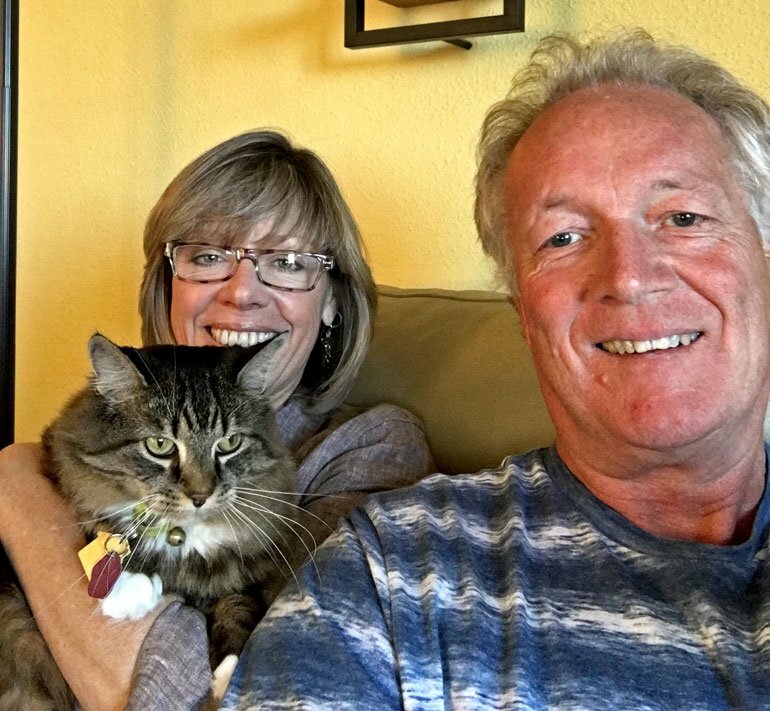 The more we looked on line, the we more we liked what we saw and the more affordable it seemed, given that we had already concluded we couldn’t afford to retire in the U.S. Initially we looked at the area around Cartagena and started to identify properties we were interested in. I found online, someone in Malaga who helped people to relocate, set up viewings of property, get NIE’s etc, but she didn’t cover the Cartagena area. However, she had someone in mind who could help us and who lived further north, Sarah Farell. During a Skype conversation with her we asked where she lived and she told us Denia and that she went there on holiday, 14 years earlier, and never returned to England. As a result of this conversation we started to investigate Denia and found some properties we liked. We discovered we would need an NIE number (Número de Identificación de Extranjero or Foreigner’s Identification Number) to do anything financially and, having read many times how bad Spanish bureaucracy was, promptly made an appointment to visit the Spanish consulate in New York City. I tried to complete the online forms, which were in Spanish, without success and therefore called a Spanish friend of mine to see if he could complete them for me. He said he would but was shocked to hear that I needed them for our appointment the following day (he clearly hadn’t paid attention during our friendship, to the fact that I was a little bit of a spur-of-the-moment person, as illustrated by how I met my wife and married her in five months). He confirmed everything I’d read online about Spanish bureaucracy and told us our visit to the Spanish consulate could be long and painful. So it was with some trepidation that we made our way to New York. Twenty minutes after walking into the consulate, and the clerk amending our forms, we were walking out with the news that we should receive our NIE’s in the post in the next couple of weeks. So much for Spanish bureaucracy. So in July 2017 with NIE’s in hand, sunscreen packed, a list of properties to view and reassurance from our accountant that we could actually do this, we left for Spain on a 9-day trip that would change our lives. We arrived in Madrid and then drove through some beautiful countryside, including fields of sunflowers, to Cartagena. The plan was to look at some property in Cartagena, maybe spend a day or two in Denia, but concentrate on the Cartagena area. After two days in Cartagena it was time to see our first property in the Denia area. As we drove further north we noticed the change in the landscape and how the vegetation was more plentiful and much greener. 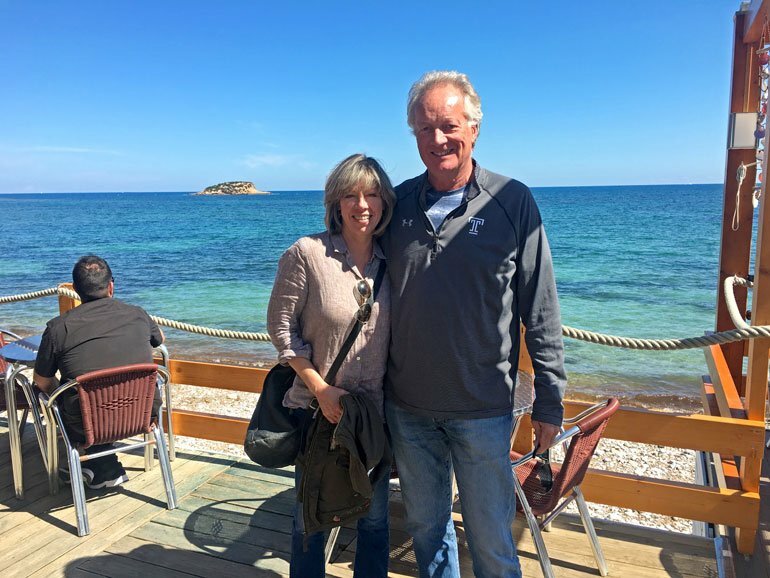 We had arranged to stay in Hostal Loreto, which is in the heart of Denia, and instantly fell in love with the history, the welcoming vibe and tapas alley, although we had no idea what that was at the time, and of course the beaches. We loved Denia so much that we returned to Cartagena only to pack the remainder of our stuff, cancel the hotel and the viewing appointments and immediately returned to Denia. The next leg was to find somewhere that we would like to live. Everything I had read and heard advised to rent first to get a feel for the area before you buy. So we completely ignored that and decided we wanted to buy a property. Now, at this point we were discussing the potential of letting any property we bought and using it part time until we were ready to move full time, but of course that changed to. Above Image – The view from our balcony in Spain, which sold us on our house. 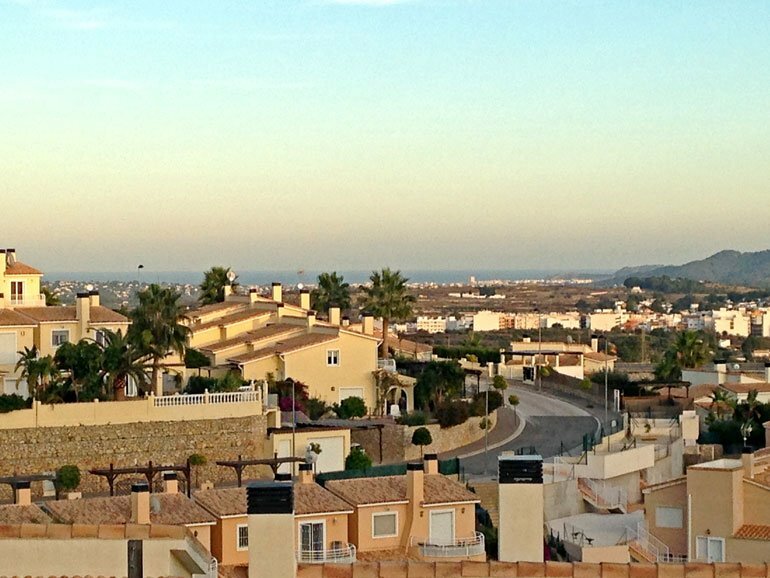 We looked at various properties in Denia, Gata de Gorgos, the Jalon Valley and more. And, as in any good property buying television programme, we narrowed it down to three and finally chose a property in Gata that has a great view across a valley to the sea, with the Montgo to our left and more hills to our right. So on the day before we were returning to the U.S. we negotiated a deal on the house and paid a deposit. Now for those of you that think that might be a bit impulsive, I would refer you back to the ‘met in June married in November’ part of this article. However, we did have that ‘Oh my god, we just bought a house in Spain!’ moment on the plane. We returned in November of 2017 to finalise the sale, fell in love with the area all over again, had the ‘Oh my god, we own a house in Spain!’ moment on the plane again and planned to move in May 2018. Now the fun really began. We had a house to sell and it seemed to snow well into the spring, which is not good for selling houses. What furniture would we ship? What would we sell? We had two cars to sell, a cat that had to have her own pet passport, which meant extensive paperwork, and get a European microchip. 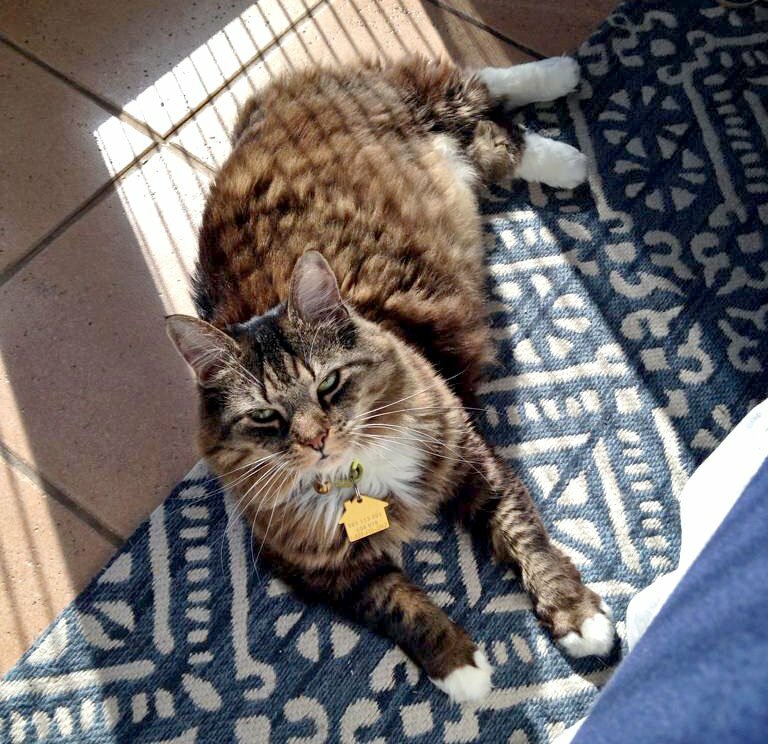 We had to get ourselves and a cat from Philadelphia to New York, because no airlines flying from Philadelphia would take a pet in the cabin. We arrived in Madrid, after a 7 1/2 hour flight and were praying the paperwork for our cat would satisfy the “notorious” Spanish bureaucracy. The customs official we handed the paperwork to had a look on his face like we had just ruined his whole day (never a good sign), disappeared into an office, counted to ten (I can’t verify that), returned and ushered us through. God bless Spanish bureaucracy. 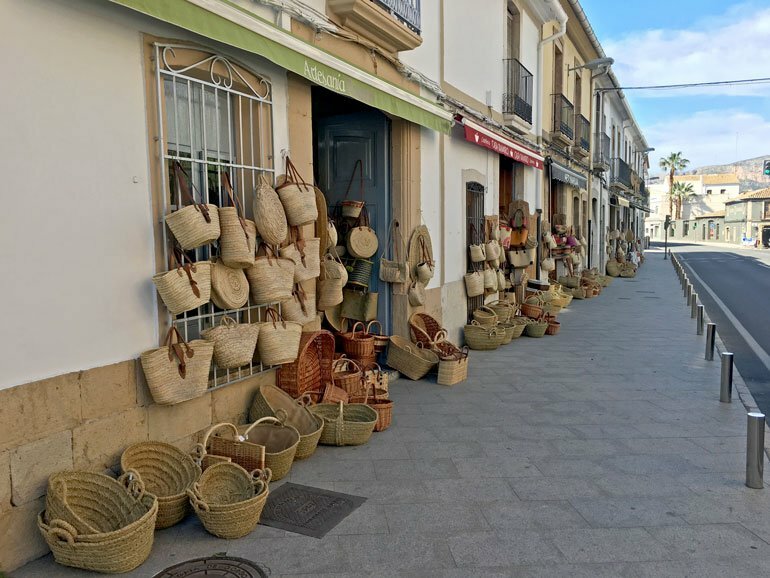 Above Image – The many charming wicker shops in our Spanish village, Gata de Gorgos. 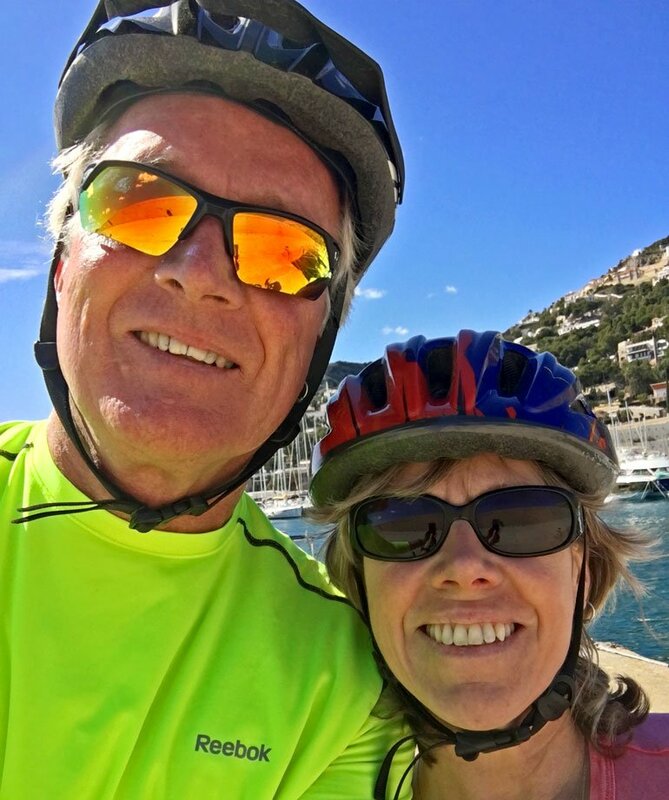 We have now been in Spain for ten months and have had a wonderful time exploring our little town of Gata de Gorgos with it’s little wicker shops, charming restaurants and fiestas and also spending lots of time in Denia and Javea and discovering beautiful towns like Altea and Alicante. We have also both obtained residencia, something again we were told would be a nightmare but was unexpectedly straightforward thanks to the help of a wonderful, quirky lady named Carmen Alesanco. We both have social security numbers, again straightforward, and are allowed to work if we choose to. We have, for the last six months, been taking Spanish lessons and getting more and more acclimated to our surroundings. Allison has had some moments where she was homesick, understandably, but is so enamoured with the area that she has completely worn out the word beautiful, by using it to describe views, the sky, the weather, the beach, the sea, flowers, food… the list is endless. We can’t believe how great the food, the wine, and the festivals are, as are the people. We have met some great people and new friends and now have ‘Oh my god, we live in Spain!’ moments, but no longer on a plane. We have also had friends from the U.S. and England visit, which helped us to discover even more about our area, as we became tourists with them. To anyone contemplating a similar move, I would thoroughly recommend it, as scary as it might be, remember you only live once and even if your experience with bureaucracy is less fortuitous than ours, the prize is worth the effort. John Byford was born in East London. He moved to the U.S.A in 1994 at age 40 to coach football (the European version not the American version). He then spent 25 years coaching women’s college “soccer”, club soccer, and in the U.S. Olympic Development Program. Allison Byford was Born in Philadelphia, U.S.A. She spent the better part of 30 years as a T.V. news production engineer, and later as a tasting room supervisor at a California winery. Hi Tracy, Thanks so much for reading the article. We’re Amalia & Eric and will make sure that John and Allison know about your question, which is great. We’re sure that connecting people like you with such a great resource will be very helpful. Feel free to let us know of any other questions you have. Best of everything in your journey! The lady that helped us is Sarah Farrell. You can email her at [email protected]. You could also join a facebook group called Denia Connect which will put you in touch with a lot of people who live in the area. If we can be anymore help let us know. Fantastic story pops.. great to see you’re doing well and everything is working out. You guys look so happy and relaxed.. love and best wishes to you both. Great story John! We miss you and Alison but I hope to come and visit and drag along your “Spanish friend”! Thanks Andy. I had the feeling you knew this guy. Very nteresting article and very true. I have never regretted coming to Spain. Pity is left it until 20 years ago. Nice talking hesterday. Speak next weekend. Love to all. xxxx Dad. Welcome to the Costa Blanca. Lovely to read your story. I came to Orba with my 9 year old daughter 33 years ago. We set up a business here which fortunately was a success and although we have had our ups and downs we love it here. Wishing you many more years of happiness in this beautiful area.